For Christmas this year I made my brother a travel version of a board game I really like. I used a balsa wood cigar box from a craft store, and little wooden dowels as pieces. 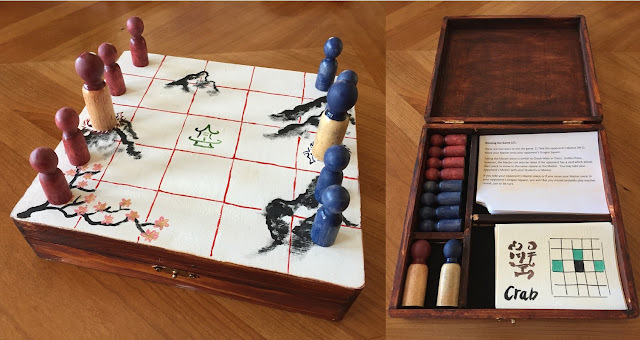 The board is painted on the top of the box, and the inside holds the game pieces, cards, and instructions. This is a general outline for making a board game. You can use this to make a wide variety of games which require a relatively simple board. This project took awhile to complete. The paint, wood stain, and polyurethane all need to dry for long periods of time, so make sure to plan ahead! There is a list of mis-steps I made listed at the end to help your project go smoother. Step one was finding supplies. The box itself I chose because it was roughly square (the shape of the board) and shallow, which meant it wouldn't take up too much space. I knew I needed two types of pieces for the game, so I bought large and small finished dowels at a craft store. I also wanted to be able to partition off the inside of the box, so I needed some strips of balsa wood (same material as the box itself). To frame the inside, I placed the pieces and cards into the empty box. I then cut out balsa wood segments to contain the pieces but still leave room so they can be picked up easily. I glued them down with white craft glue. See 'Things I should have done differently' (below) regarding balsa wood height! Next I painted the board*. Originally I had planned on painting the inside of the box as the board, but it was a pretty small space, and would have made playing the game frustrating. Next I tried painting the top of the box but leaving an edge around the board. This ended up still being too small of a board to be easy to use. In the end I used the whole surface of the box top for the board to maximize space. The top is painted with acrylic craft paint. I drew the lines for the board after the underlying design was finished. The bottom of the box I painted a solid white for symmetry. *This was the wrong order; you should stain the box first! See below, and avoid my mistakes! The pieces are colored with the same acrylic paint. Because the pieces were already finished when I bought them, they did not take paint well. The smaller pieces were semi-finished and so the paint ended up staining them in an interesting way. The larger pieces were heavily lacquered, so paint did not stick to them at all. I ended up dipping the tops of the large pieces into paint, which made for a solid shell around their tops. The large and small pieces were then coated in polyurethane to protect them. The inside and outside edges of the box were finished with a dark wood stain. I unscrewed the hardware from the box prior to staining to keep it clean. Once the stain was dry I then coated the inside and outside of the box with 2 coats of polyurethane. See below regarding polyurethane and craft paint! Once the polyurethane was dry I used felt in each compartment to reduce wear and tear on the pieces (and make the game quieter to carry around). The felt was glued down with the white craft glue. The cards used for the game I painted on water color paper which I had cut into 1/8ths. First I did a very light brown watercolor wash over the entire card to give it a slightly aged look, then I drew the grids in ink. I finished by watercoloring the name and squares. The instruction cards I printed on card stock. I cut out a small quarter circle in each corner to make them easier to pick up from inside the box. And that was it! I'm quite happy with how the box turned out, and the play-testing was a success! 1) The balsa wood pieces I used are too short, which allows the contents of the box to move around if the box is not kept upright. 2) The acrylic paint I used became slightly translucent with the polyurethane, so in some places you can see the original smaller board outline peaking through the white paint. 3) Staining the box is super messy! Do it BEFORE you paint the box or you will be doing Lots of touch-up work! An amazing ideas to create cigar boxes crafts on Christmas. I really loved it. Please keep sharing more!! !